Story Time With the Library Lady: Theme Of the Week: ABC/123:Loud, Active & NOISY! Theme Of the Week: ABC/123:Loud, Active & NOISY! Fall programs can be tough to plan. I look at past years and see the same themes cropping up over and over--you know. Apples. Fall. Pumpkins. Stuff like that. And I love those themes. I have lots of cool things for them. I want to do them, I just don't want to bore myself--or the parents/nannies that have come with more than one child! So I try to mix things up. Use some of the same stuff, but in a new version of the theme, with new stuff added. Which was what happened to what otherwise might have been a basic ABC/123 kickoff program. BOOKS:I was inspired by this book, in which a bunch of kids "do the alphabet", count, name colors, animals and vehicles. And each time, they are urged to "Shout! 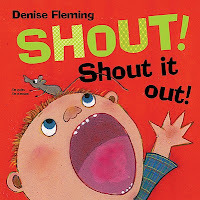 Shout It Out!" Just my kind of book since I am apparently the descendent of generations of subversive, anarchistic types. You think a library story hour should be tame and quiet? HECK NO!! Nope. At MY story hours kids get to talk back to me. They get to make animal noises. They get to sing. And they get to MOVE! 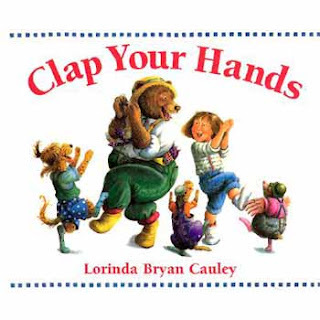 So we started with this book. The kids had a blast with it. Instead of naming the animals, we made animal noises and on the last page, we just did the alphabet and the numbers again. Loved it. The "usual" theme I built this around was what I call "ABC/123". 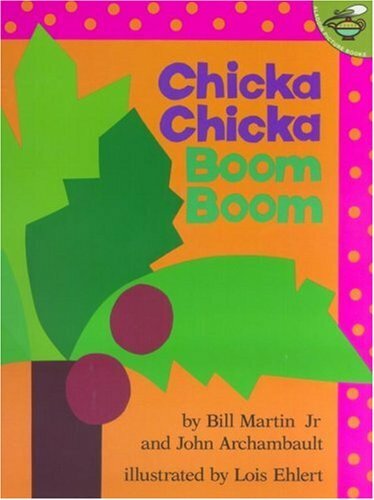 So since we'd done the alphabet, the natural follow up book was "Chicka Chicka", as a "Big Book". Followed, of course, by singing the "ABC" song. Maurice Sendak's "Nutshell Library" books, sung to their Carole King "Really Rosie" tunes, have been a staple in my house and at my programs for years. The books are too small to use in programming, but years ago we enlarged the illustrations for this book with a color copier, cut them out, covered them with contact paper and added magnets. 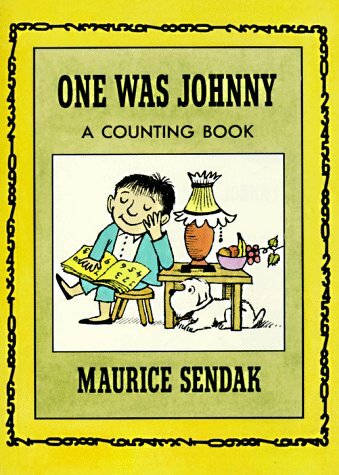 One of my favorite number books, and a nice loud one! I pulled this paperback book from a batch of stuff in my "reading room" and was glad to see that it still may be available as it was a perfect way to end the programs. This is not a sit down book--except when the text tells you to do so! Instead you will be doing everything from roaring like a lion to blowing a kiss to telling a secret to hopping on one foot! And finally, you "wave bye-bye". I DID omit the line about "turning a somersault", which probably wouldn't have been a great idea. My preschool kids LOVED the "I'll tickle you if you tickle me" and used it as a chance to take turns tickling ME. How come the teachers got off so easily? I play various dance/movement games with the kids as fillers. This week two were "Shake Your Sillies Out" and "If You're Happy And You Know It". When I did this program for some of my favorite kids from a preschool this morning, we also did the Nancy Stewart "Hopping Like A Bunny" game with my slide whistle! It was a great first week back. And not boring. Not one bit!! Theme of the Week: "Mouse Apples"